Villanova, PA – The #2 ranked Florida Gators lacrosse team has been a force in the Big East for the three seasons they’ve been a member. Not only has Florida earned each regular season championship, the Gators have also gone three-for-three in the Big East Tournament. 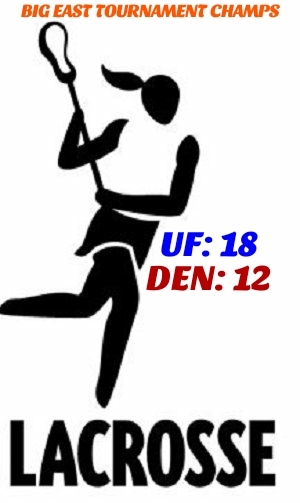 Florida earned their third conference tournament title with an 18-12 victory over conference newcomer Denver. The Gators will now prepare for the NCAA tournament, which starts next weekend. Mollie Stevens set the tone from the beginning for Florida. Stevens won the first two draw controls, and would score on both possessions. Stevens finished with five goals en route to being named Most Outstanding Player in the tournament. Florida had a 4-0 lead before Denver finally got on the board with 21 minutes to go in the first half. The Gators led the Pioneers 11-4 at halftime. The second half saw a much more balanced game as Denver had much more momentum than they did in the first. Denver, however, was never able to get within five goals of Florida. Sammi Burgess, Lindsey Ronbeck, and Sydney Pirreca each added three goals to the Gators scoresheet. Shayna Pirreca and Carli Marsh both scored twice for Florida’s cause. Denver was led by Julia Feiss with five goals and Emily Conway with four goals. Florida is ranked #2 in the country and is an automatic qualifier for the NCAA Tournament. The lacrosse selection show is Sunday night at 9:00 PM on NCAA.com.